NOTE: All photos used with permission and as attributed, by Jim Gourgoutis, Carlos Duque and Dr. William Bowen. At thirty minutes past midnight on what is now technically Sunday I'm staring at a pile of sodden, heavy, and cold clothing and thoroughly soaked cycling shoes I've just dumped from my backpack onto the floor at my feet. My Dave Yates Randonneur bike is leaning against the washing machine in the utility room, still dripping rain water and road gunk. I feel great. I have no apparent reason to feel great, but I do. I'm not really sure I can ever convince anyone that a ride that included ten hours of rain soaked roads and near gale force wind gusts could be called a great ride, or even a good one. But that is what it was. A great ride. All through the week I had been checking the NOAA weather forecast for Jenner, CA and Healdsburg, CA. These were the northernmost points on the loop that defined our route on Saturday's San Francisco 300km brevet. Even a week out it didn't look good with a forecast of 30% POP (percentage chance of measurable precipitation), and each day leading up to the ride the forecast POP would increase. By the time Saturday's 4:00am forecast for the day was issued, the POP was listed at 60% for the daytime, climbing to 80% by evening. When I first began my involvement with double centuries and brevets, my friend Bruce Berg had commented that each year the rides just get easier. His point was that what you had the second year that you didn't the first was the knowledge that you had finished before and you could do the ride and finish again. That kind of knowledge definately works not just for distances but for conditions as well and having done the 2006 SFR 200km in miserable conditions, I had some context for and confidence in what was to come on this 2007 SFR 300km. Bruce had collected Dan Brekke and Agnes Callard on his way over to pick me up at 4:45am for the drive over to the brevet start at the Golden Gate Bridge. Bruce and Dan are PBP anciens and therefore have many brevet kilometers under their belts. Agnes is riding her first season of brevet rides, but we all have PBP as our goal. This day's brevet is but one step toward that goal. At this point it wasn't raining yet, and hadn't for quite a while, but none of us even considered that the day ahead would play out without rain. The parking lot off Lincoln in the Presidio was steadily getting busier and lot of hellos were called out when old friends from past rides were seen. Knowing full well his opinion about riding in the rain, we were all happily surprised to see Mark Abrahams all rigged up ready for the day's ride. One by one we made our way over to the statue of Joseph Strauss where Todd Teachout gives his pre-ride talk. I was eager to get over there because I always enjoy meeting riders at the start of the ride. With a rider limit capped at 100 riders, these mass start group rides have a nice feel about them, like a gathering of friends. Unlike on the 200km ride a month before, when Todd signaled the start there wasn't as much of a clumping of riders as we crossed the bridge headed for Marin. Also unlike the 200km a month before, I knew how many riders where ahead of me at this early point. Once over the bridge, the pace was faster through Sausalito, CA than I was used to, and an uncooperative reflective Sam Browne Belt was making the early miles less comfortable. I had fallen off the back of the pack Bruce was in and only managed to catch up in Mill Valley where the route does a one block zig to the left from the bike path before a zag to the right to climb the Corte Madera grade. One thing that is making riding in these early months of 2007 much more enjoyable is the greater ease I've achieved on climbs. Since October of last year I've been focusing on hilly routes and the focus has paid off for me. While it was quite difficult to catch Bruce's group on the flat bike path across the marshes to Mill Valley, it was much easier to catch up and catch my breath on the climb here. The route from the Bridge to Sir Frances Drake Blvd. well past Fairfax is standard on the San Francisco Randonneur's brevets, and having ridden this route many times on many different rides, it was easy to chat as we rolled along and the turns came without thinking. I did have to call out to other riders once as they rolled past a turn ahead of me. For those unfamiliar with the course it is clearly harder to do these early miles as there are so many turns and while it is a locally well established bike route, local riders know it from repetition, as the markings vary from clear and obvious to much less clear and even obscure. Still, riders from out of the area have plenty of other riders to follow who do know the route well. Once past Fairfax, and the end of populated areas for quite a while, the route climbs White's Hill and for a short time I rode off ahead of those I was with and caught Zach Kaplan on his recumbent. Knowing the downhill to San Geronimo, CA was coming up though I didn't even bother to pass him as I knew he'd roll down much faster than I could manage. I caught Zach again inside the Samuel Taylor State Park boundry and we chatted as much as we could while dodging the many potholes that comprise the road through the park. Bruce and Iva, a rider he knew from a previous ride had caught on to a tandem ridden by Karen Bonnett and Mark Gunther and in their wake had caught Zach and me before the turn onto Platform Bridge road. Last year on this segment I was struggling with foggy glasses but this year with new riding glasses the problem was mitigated. 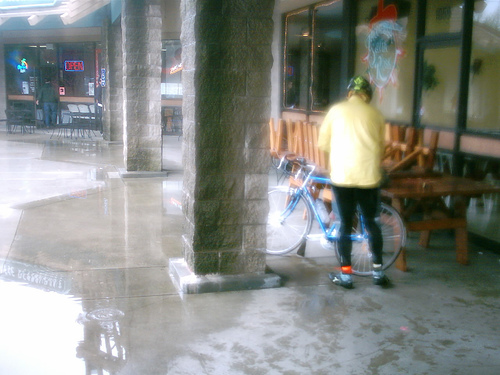 The roadway was wet with a recent shower and we rode in and out of sprinkles as we navigated the rollers here. Everyone was thinking that if this was as bad as it gets all day, that would be just fine. 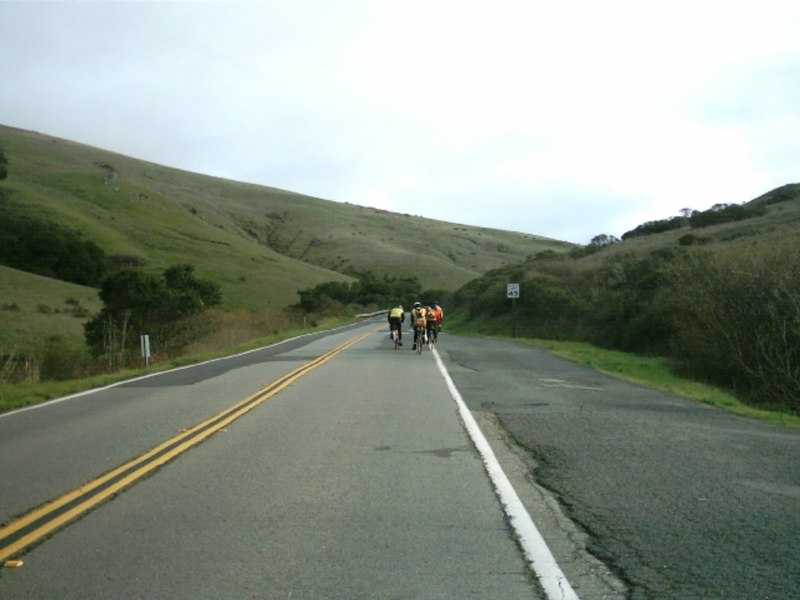 Along the climb past the spillway below Nicasio Reservoir our group had fragmented a little and I rode behind David Neff along a debris strewn shoulder until the (not so) secret control came up. We all gathered once more at the control but left individually. Controls on brevets are basically checkpoints where riders record that they've arrived within time limits, and some brevets have secret controls, usually at points on the course that insures that no one takes short cuts. This day's secret control is only 30 miles into the course and we have 20 miles of undulating terrain to cross before the first normal control in Petaluma, CA. It is there that we'll have our first real chance to eat, adjust things on our bike and in our packs and see more of the other riders on the course. 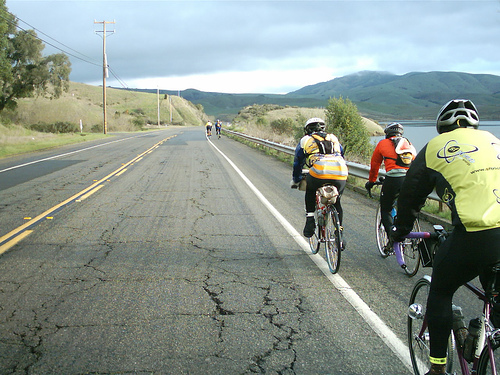 There are two noticable climbs between the Nicasio Reservoir and Petaluma, and those serve to separate all the riders that had been in our informal pack before the secret control. However, Iva, Bruce and I manage to group up for the last few miles through town on the way to the Safeway store, the official control. In the store, shoppers and store staff don't really know what to make of these oddly dressed people that have arrived. As Bruce and I stand in line, the cashier relaxes a bit and asks us about our ride. We made short work of our stop and Iva, Bruce and I find that there are a few other riders ready to roll as we do. Our group of three is now a group of seven with Bob Buntrock, David Neff and Karen and Mark on the tandem now with us. I'm a bit surprised that Bob is still around, as he is normally a much faster rider than I am, and later on he will show that but for now he rides with us, catching up on how we have been since we last rode together. 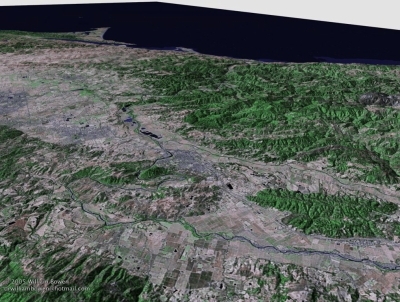 As we put Petaluma behind us on the way north, we approach the spot where last year my group went off course, dithering away 30 minutes of valuable time and adding seven to ten miles to the day's total. We safely make the turn this time. Santa Rosa Avenue, the road we are on the longest on this segment, is made up of very gentle rollers and from here we can see far to the west where the clouds are looking very dark. Once in Santa Rosa, it begins to sprinkle, and Bruce and I stubbornly neglect to stop and put on our rain gear. This is a mistake, but it proves to be a minor one, as the gentle rain turns into a steady and heavier rain before we reach Healdsburg, CA, our second normal control. Naturally, we get stuck at a long light at a complicated intersection within sight of our lunch stop. One of the motorists waiting for the light alongside us rolls down his window to tell us something. I worried that this would be another time when we'd hear how we should get the hell off the road, but instead the driver tells us of how in his youth back in the 1950s he would ride his single speed bike all around the hills surrounding Healdsburg. It's a nice exchange and one that sets an uncommon, but very welcome tone for the rest of the ride. Once at the shopping center, Bruce goes off to order our lunch as I go to get the two receipts at the Healdsburg Safeway store we need to prove our presence at the control. I had looked forward to this particular stop even before the ride had started. Bruce, Dan, Carlos Duque and I had discovered there was a Santa Rosa Taqueria a few doors down from the Safeway when we were riding last year's 300km brevet. I was so spent last year at this point that a longish, leasurely lunch was just the ticket. It is still a welcome break from being out in the rain, but somehow the experience this year didn't live up to the memory of last year's break. Just as Bruce and I were organizing all the rain gear we were swapping for the wet vests and windbreakers we had taken off, Dan Brekke showed up. Dan was skipping lunch this day due to an upset stomach he had fought earlier in the ride. He was ready to go, save for taking on some liquids so I gave him most of my Gatorade and we rolled out into the remains of the rain showers. Westside road and River road were all rain soaked, but the rain would stop and start as we rode along, covering the fifteen miles between Healdsburg and the coast. A third of the way along this segment Dan got the first of his two flat tires on the day. We all three stopped here and helped Dan in small ways deal with the repair and while we did this a half dozen riders passed by, including Mark Abrahams and Zach Kaplan, each riding solo. Mark told us later it only registered that there were three riders stopped on the other side of the road and he didn't notice it was us, but Zach had rolled by and acknowledged us. Alas, for Zach, it was his turn after a short while to pull off and fix a flat. At this point, I think it was safe to say that the riders on the brevet divided into two groups: those that had flat tires, and those that were dreading getting flat tires. Standing in the rain and increasing wind was no fun. It was a day when pedalling was your best chance to be comfortable and warm as you burned all the calories you could stuff into yourself. Bruce frequently mentions that he operates under the assumption that he burns about 40 calories a mile. I'd say that on a day like Saturday, he and everyone else would be burning a little bit more than average. Each of those miles would be harder to achieve once we made a southward turn onto Highway One where the Russian River meets the Pacific. It was there that the south winds evaded the protecting hills and hit us full on. Highway One just south of Jenner is usually a cycling dream. The road surface is buttery smooth for several miles, the views of the ocean are dramatic, and the path the roadway follows is a little like an amusement ride with swoops inland where creeks meet the ocean followed by little rises back to the shoreline. Not this day however, and little did we know that the gusts we were facing then were just a warm up for the bigger, windier acts to follow. Todd had dropped the Bodega Bay control from last year, but hinted that riders may need to stop there still. Dan, Bruce and I rolled through Bodega Bay but in the end needed to make quick stops in Valley Ford and also Tomales. Highway One leaves the immediate coastline in Bodega Bay and heads inland a bit to reach Valley Ford, and then takes a 90 degree southward turn to head toward Tomales. The surrounding landscape is completely exposes riders to the wind and our only relief came on the uphill climbs when the hill would block the blast of the wind. All this relief was taken back though as we would crest the hills and get wind and stinging rain directly in our faces. After not seeing another brevet rider since River Road, we happened upon Iva who was battling solo against the wind. She kept pace with Bruce and Dan the rest of the way to the Marshall Store and control, but I had to stop and eat as I got light headed. Ironically, we were barely a mile from the store but I don't think this cost us any time. 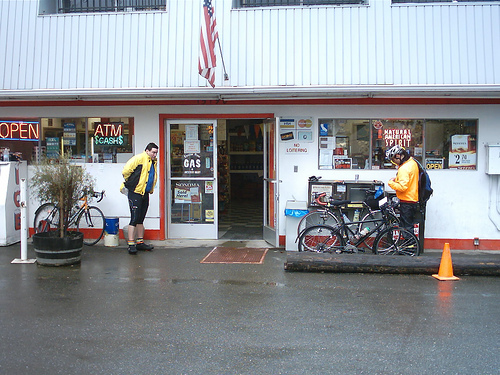 The Marshall Store was a welcome relief from the wind, rain and cold. Iva couldn't afford the stop though as she was shivering if she was sitting still so she took the first opportunity to ride on. I was quite surprised to meet Veronica Tunucci and Mark Abrahams still at the Store. I had known that Veronica had passed Bruce and I while we ate lunch in Healdsburg, and Mark had passed us some many hours before as well. We also met Barley and Susan Forsman, one of the pair of riders we were passed by on Westside Road during Dan's flat tire repair and we sat and chatted with them as we ate warm clam chowder and bread. The Marshall Store has recently changed hands. 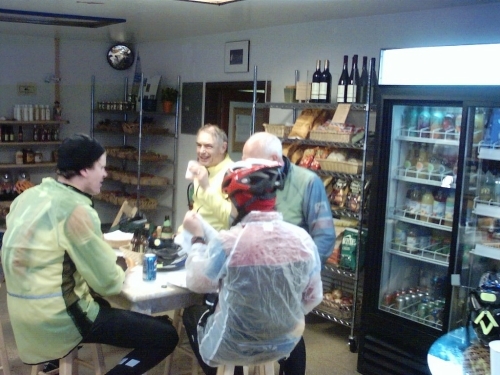 The staff on hand this day were wondeful hosts to a sorry parade of soggy riders, and I heard later that they stayed open later than their usual 6pm closing time, largely because brevet riders were still showing up and they didn't have the heart to turn anyone away. While we were there they were very welcoming to us, and you can bet that anytime I'm in the area I'll want to stop and revisit the store. Fortified with clam chowder and chocolate milk, which you might be surprised how well they go together, I joined Bruce and Dan as we began the last 40+ miles of the ride. We had had breaks in the rain along the way so far, but from this point on the rain breaks were no more. A pelting stinging rain hit us in the face on any southbound leg. The wind eased a little as we made the left turn onto Point Reyes/Petaluma Road, and quite a bit more after the junction with Platform Bridge as we closed the big loop that defines the northern two thirds of the route. The climb past the spillway below Nicasio Reservoir, done in the drier daylight more than ten hours before was quite wet now with the falling rain, but for a short while we had a blessed tail wind. The roadway in places is cut through the rolling hills, leaving behind open rock faces on small cliffs. The rock is not a very sturdy kind however and sharp chunks break off and litter the shoulder of the road. Dan had dropped back here and as Bruce and I paired up and used our combined lights to pick out the rocky hazzards we kept an eye on our mirrors looking for Dan's headlights. Barley and Susan were behind us and we couldn't tell if Dan was with them until they passed us as we slowed. 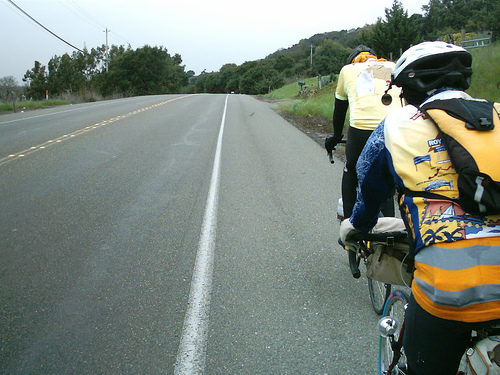 Dan eventually caught us at Nicasio as we negotiated the dog leg turns past the baseball field. My least favorite stretch of road was ahead of us, but much in my favor this time I had Bruce and Dan to pace me up the hill that usually causes me to struggle. The hill still got the better of us this time as Dan flatted once more on what seemed like the darkest stretch of the road and only halfway to the crest. While the rain still fell, we were at least sheltered from the wind by the hill itself and the woods all around. I had rolled just a little ahead to take care of some business when I heard a hissing sound that I couldn't at first pinpoint. I checked my tire pressure front and back by squeezing the tires, but both seemed at full pressure. I rolled my bike back a tad and heard the hissing again and this time located it where the tire met the road in a puddle. Sure enough, I had a flat too. My flat was on the front wheel and therefore I got off easier than Dan, but still it was comical how hard it was to deal with this flat. I wanted to get off the roadway because a light but steady stream of cars were passing us on the roadway. The verge of the road was extremely short and dropped off in a ditch filled with redwood duff, and bending over to extract pumps, tools, spare tubes and to struggle with tire irons and the like would cause my back to ache. Bruce had his hands full even if he was the only one without a flat to fix. He had to handle the lighting so we both could see our work and also signal the cars coming upon us so they would slow in time and give us a wide berth. It is surprising that under what might appear to be the worst circumstances my mood stayed upbeat. I can honestly say that the only reaction I had to the whole situation was amusement. I needed that feeling of amusement to carry me through what was ahead. I had thought we were near the crest of the climb but it turned out we were still but half way up the hill. There was no mistaking it when we did finally make the summit. The wind was roaring here and the rain again stung our faces. The roadway swooped right and left across the wind and the wet roadway would have caused us to want to slow down anyway, but the headwinds did that for us. At one point the road bisects a golf course and travels under a bridge for the golfers and carts on their way to the next hole. Under any other conditions we'd be flying down the hill here, but instead we had to pedal and pedal hard just to keep forward momentum. I should have eaten while we were stopped before, but hadn't done so and now drifted off the back of Dan and Bruce's small paceline and then I simply had to pull over to eat. Dan and Bruce waited for me at the top of White's Hill for the ride down into Fairfax. Again the wind played havoc with our descent but we all made it safely down hill. Back once again in more heavily populated terrain, the buildings and trees helped block the wind a bit and we made progress through Fairfax, San Anselmo, Ross and Corte Madera. I got a little bit ahead on the climb up the Grade and for that effort was the first to catch the wind gusts full in the face when I reached the top. From this point we needed only to bull into the wind along the bike trail into Sausalito, and then climb up to the Vista Point parking lot at the north end of the Golden Gate Bridge to make it to the finish. Dan was able to charge into the wind with seeming less effort than either Bruce or myself, and as we neared the underpass under Highway 101 he was too far ahead to hear us call out whenBruce wanted to stop to take a hit from his Hammer Gel flask. On the 300k last year I needed to stop a quarter mile from the bridge because I needed to eat to go on. I decided to get that done while stopped with Bruce and just as we were ready to go Dan had come back. Just before we left the bike path we dodged a large branch that had broken off a tree to the east of the trail. Later we heard that Agnes had ridden right over it, but without incident luckily. The route through Sausalito is mostly at sea level but just south of the center of town the roadway climbs, levels off slightly and then climbs again to reach the Vista Point parking area. Just before we turned off the Sausalito Lateral to cross the VP parking lot, I hit a rock and could tell my front tire was going soft. Again I was stymied within sight of the bridge. Earlier in the day, I had given away my second spare tube to Mojo Cosgrove who had suffered three flat tires by the time we found him walking along River Road. I had hoped the good karma of giving away the tube would carry me through the end of the ride. Not so, but instead of changing out the tube I just pumped it up and rode on figuring I'd stop and do the same as much as it was needed to get across the bridge, and if not I could walk. Even before we made it to the northern tower the winds stopped us dead, forcing us into involuntary trackstands until we gave up and dismounted. The winds eased enough as we cleared the Marin Headlands, which seemed counterintuitive, but nevertheless we could ride again albeit very cautiously. First I had to pump up the tire again and Dan got ahead as Bruce waited for me, but we both caught him as he waited for the nighttime security gate to be opened, and as a trio we made it to the finish to be greeted by Todd. The whole ride took us longer this year than last, 15:43 this year compared to 15:21 for me last year (and less time last year for Bruce and Dan). Even still, considering the conditions, I consider this a big improvement over last year. Four flat tires, ten hours of rain and huge headwinds with what had to be 30+mph gusts certainly trumps two flat tires and a little extra mileage due to going off course, all in pretty ok weather. I was reminded of the wonderous properties of wool when I was finally changing into dry clothing after the ride. We arrived too late to use the public restrooms at the Bridge so we just changed outside the car in the dark. As soon as I took off my wool layers it hit me how cold it was. Dry cotton was no match for wet wool in keeping me warm, so I hurriedly finished the change and got into the car where Bruce had the heater running full tilt. About an hour after we finished Agnes finished the ride, having done most of the ride with our fellow club member Kevin Foley. We loaded up Agnes' gear and bike and headed straight for Marin Brewing Company for a very late dinner. Hot tea, followed by warm food and capped off with a little beer and I was quite content. Agnes filled us in on her ride through the day and it was easy to tell she was elated to have met the challenge of the day. For someone doing only their second brevet it is impressive to see her do such a ride under extreme conditions and finish with a huge smile on her face. Of the 100 riders signed up, 87 showed up to do the ride which I think is pretty impressive. 75 riders finished the course, again an impressive number. Lisa McPhate's writeup of her tandem ride with her husband Jason. Agnes Callard's writeup. Agnes looks on this ride as her first "real" brevet. JimG's account. I borrowed a number of photos from Jim for my own writeup. Carlos Duque's writeup. Carlos also has photos, again some of which I borrowed. Dan Brekke's writeup. Dan's a writer. I'm a typist, and some would argue not a very good one.